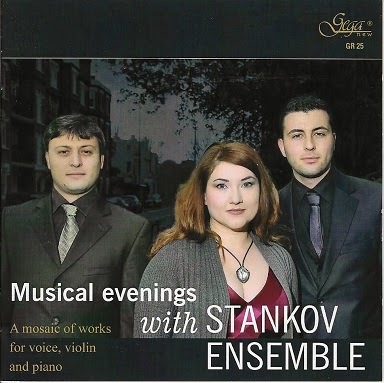 The Stankov Ensemble consists of the slightly unusual combination of soprano, violin and piano and the performers are the Bulgarian brothers Ivo (violin) and Lachezar (piano) Stankov, along with Ivo's wife, soprano Vania Valtralova-Stankov. The ensemble has performed together since 2008, and on this disc Musical Evenings with Stankov Ensemble presents a rather enterprising and surprising programme for soprano, violin and piano. They start with songs by Louis Spohr and Charles Gounod, and follow these with songs by Rebecca Clarke, Gustav Holst, Sergei Rachmaninov, Arthur Bliss, Alan Hovhaness, Georghi Arnaudov, Antoni Donchev and Emmanuel Chabrier. Louis Spohr (1784-1859) was one of the most successful German composers of his generation though he was to a certain extent overshadowed in the early part of his career by Weber and then later by Mendelssohn. His set of six songs, Sechs Deutsche Lieder Op.154 setting German poems by his cousin Friedrich Ernst Spohr, were originally written baritone in 1856. The Stankov Ensemble perform four of them. Abend - Feuer, Jagdlied, Tone and Der Spielmann und seine Geige. They are well made lieder with a certain period charm but what lifts them is the expressive violin part. This is more than just an accompaniment and heightens the mood a great deal, providing nightingale-like echoes in the night reflections of Abend - Feuer, and creating some almost virtuoso moments as the protagonist of Der Spielmann und seine Geige ( The Minstrel and his fiddle). Vania Valtralova-Stankov has an attractive lyric voice with quite a bit of underlying heft to it, which she uses expressively in the songs and Ivo Stankov partners her effortlessly on the violin with Lachezar Stankov providing the discreet piano accompaniment. Next the three perform a song by Charles Gounod (1818-1893), Serenade which is perhaps his best known song and published in 1817 in versions not only for voice and piano, but also with obbligato cello or violin and it is this latter which they perform. The addition of the violin does set the song off nicely. With the next group of songs, the performers move the recital from the interesting to the fascinating as they perform a group of songs by Rebecca Clarke (1886-1979) who studied with Stanford at the Royal College of Music. She became a prominent international performer on the viola, and composer of a small but notable body of music including a viola sonata which tied for first place in a competition held by Elizabeth Sprague Coolidge (and in which commentators later thought the judges had assumed that the name Rebecca Clarke was a pseudonym for a man). These Three Irish Country Songs for soprano and violin are a real discovery. They were written in 1926 and are arrangements of traditional Irish songs, I know my love from west of Ireland, and I know where I'm going and As I was going to Ballynure. Before we consider the songs, we have however to address a couple of other issues. Vania Valtralova-Stankov is not English and her sung English, whilst creditable and understandable does have a noticeable accent. Also, she has a very Slavic style voice with significant vibrato; this is expressive and controlled, but is always a distinct presence and I do rather feel that she might have benefited from being recorded at somewhat greater distance. However, frankly neither of these issues was a problem and her performances of the Rebecca Clarke songs have great charm, with Ivo Stankov providing a lively commentary in the violin part, with Clarke's writing often referencing the style and rhythms of Irish popular fiddle music. For me, the next group of songs are of equal if not greater interest, Four Songs Op. 35 for violin and voice by Gustav Holst (1874-1934). The words all come from an anthology of English medieval verse, which Holst set in 1916-17 having got the idea for the particular combination of voice and violin when he heard one of his students singing to her own accompaniment. The four songs Jesu Sweet, My Soul Has Nought but Fire and Ice, I sing of a Maiden and My Leman is so True of love all have a folk-like feel without ever being exactly folk songs and they are all austere and contemplative in Holst's quite severe style. Vania Valtralova-Stankov's voice works well in these songs as its vibrant character combines with the slower moving line to make something rather expressive. She and Ivo Stankov make something striking, memorable about these. From Holst's expressive austerity to Sergei Rachmaninov (1873-1943) being heart on sleeve with Oh, cease thy singing maiden fair in an arrangement by Fritz Kreisler which gives the evocative Georgian melody in the song to the violin. All three performers imbue the work with intense and exotic passion. Arthur Bliss (1891-1975) wrote his Four Songs for voice, violin and piano in 1927; two of the songs are for violin and voice only. From these Vania Valtralova-Stankov and Ivo Stankov perform Sea Fever setting words by Charlotte Mew, which is powerful and dramatic, with Bliss giving the violin an angularity which expresses the woman in the poem's emotion. Alan Hovhaness (1911-2000) was an American composer of Armenian and Scottish extraction. His Hercules for voice and violin sets his own poem was written in 1959, about Hercules labours, including building a path up to heaven and down to hell. And here we enter a very different sound world, which pushes tonality to greater extremes and includes passages in unmeasured time, with Hovhaness including vocal and violin techniques from the Far East. It is darkly dramatic, with much declamation and keening, combined with some striking violin playing into a dramatic whole. The Bulgarian compose Gheorghi Arnaoudov (born 1957) was a name new to me. His Lonesome Whispers for voice, piano and violin set three poems by the Bulgarian poet Peyo Yavorov (1878-1914). The influence of Arvo Part seemed to come into the songs, along with other more complex hints. The music is tonal, thoughtful and contemplative with the melodic material for the soprano being expressive rather than especially memorable. But they combine to create a musical voice which has its own distinctive timbre, and I would like to hear more of his music. Whilst Arnaoudov sets Bulgarian texts, Mish Mash by another Bulgarian composer Antoni Donchev (born 1959) is a vocalise. The work is based on an instrumental work written in 1995 which Donchev has transcribed for the Stankov Ensemble. It has clear jazz roots and lots else besides, and makes another appealing new voice on the disc. Finally a lovely bit of fun. The orchestral work Espana by Emmanuel Chabrier (1841-1894) was arranged for voice and piano by one of his contemporaries (though Chabrier may have himself tinkered with the words), and is here performed in a new version by Simon Kent which adds and obbligato violin. This brings a nice degree of verve to the piece and makes a delightful conclusion. There is a great deal to enjoy on this disc and the Stankov's enterprising choice of repertoire with their investigation into English language song for voice and violin has much to be commended so that the songs on this disc are anything but ordinary and a musical evening with the Stankov's clearly has lots of elements of the unexpected to delight. Performances are always of a high standard and to much to both move and charm. Not everyone will warm to Vani Valtralova-Stankov's Slavic timbre in her voice and perhaps the recording here does not always help, but she is always expressive even when wayward and I have to give her credit, enterprise and bravery for committing so many lesser known English language songs to disc. Do try the disc, there is much to enjoy. You can buy their CD from the Stankov Ensemble's website.